I’m not alone I know in loving Swindon’s Old Town Gardens. Tucked away in the heart of Old Town they are simply delightful. They are home to the music bowl, the lovely bandstand, the aviary and the refreshment kiosk – which started life in 1914 as a trade stand for the Great Western Railway. Additionally the gardens play host to the fantastic cross-cultural Mela beloved of Swindonians of all kinds and has its own Bowls Club where I had a delightful coffee, scone and natter on the day of the Mela last year whilst waiting for a heavy shower to pass over. Hence it’s been wonderful to read Caroline’s impassioned account, see below, of her affection for this lovely garden-park, treasured memories of which brought her back to Swindon for the birth of her second son. 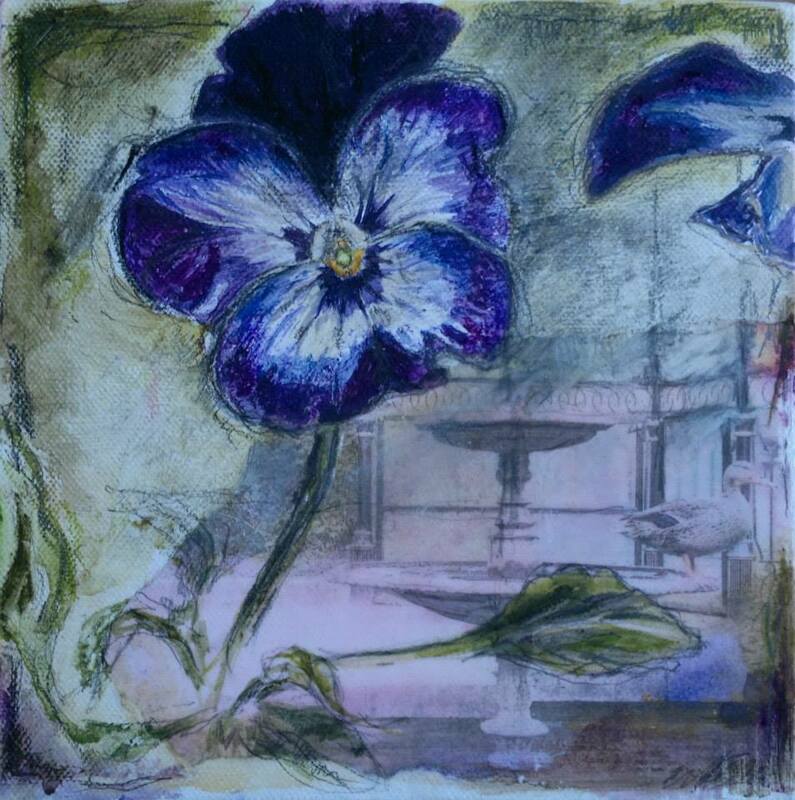 ‘Selected items from the ‘ Old Town Gardens’ Art Work – Swindon ‘ group will be exhibited on this page. Please enjoy, ‘like and share’ the art work. Description: For many years artists have been inspired by the picturesque beauty of Old Town Gardens, Swindon. This page is to exhibit the visual art work of artists who have produced exciting work as a direct response to their passion for the park.’ Isn’t that just the most wonderful idea? Isn’t it just great that a group of artists are so inspired by the Town Gardens? So I’ve been busy sharing away on Born Again Swindonian’s Facebook page – and a recent such share prompted an acknowledgement from its creator Caroline Day. I contacted Caroline and asked if she’d be happy to write me a piece about how it all began. And here’s her amazing respsone to that request. Thank you so much Caroline. It’s inspirational. “I live on Goddard Avenue and walk my two boys to primary school through the Town Gardens every day. I am passionate about the beauty of the park and have been recording it with the use of photography for 9 years. More recently I decided to combine painting, drawing and collage to try to capture my fascination and reverence for nature within the gardens. I often see other artists painting or photographing within the park. A few years ago I was astounded by snow sculptures an unknown artist had created. After searching unsuccessfully for a forum for artists to view and share work based on Old Town Gardens I decided to create my own. ‘Old Town Gardens’ Art Work – Swindon’ is for painters, sculptors, photographers, print makers and alike to post, share and discuss art work which has been inspired by their visits. Art work is selected from this group page and exhibited on the community page under the same heading to a wider audience. I was born in Princess Margaret’s Hospital, Swindon in the summer of 1971. Throughout my childhood years my mother and father took me and my older sister to local parks and picturesque gardens within our home town. This included one adjacent to my school – Penhill Infants and Queens Park (when a shopping spree was called for). Less frequently, and as a ‘real treat’, we were driven to what I remembered to be an opulent, magnificent area called ‘Old Town’ – to Springfield Road. Here we would enter into the elaborate wrought iron gates of the awe- inspiring ‘Town Gardens’. For what always seemed to be a short time, we would get to visit the aviary, the monumental bandstand, the ‘Bowl’ and the alluring, fragrant ‘Rose Garden’. It was the treasured memory of spending time in captivating places in Swindon such as this that enticed me to move back ‘home’ before the birth of my second son. Having worked with art, in educational establishments as a teacher, advisor and senior lecturer for over 18 years, I decided last year it was high time for me to focus on an art project of my own. Now that I am living my dream, close to Old Town Gardens, my family, relatives and kinfolk. As a wife and working mother I think it is very easy to devote to others and to children and over time one can lose a sense of oneself. I spent many years encouraging students to produce visual art work as a response to their identity, emotions and experiences. As a facilitator of knowledge I found it important to learn all types of skills in order to share, motivate and encourage others to create. Now that my two children are in full time education I believe that this is the time for me to re-invent myself and return to explore my own passions in a visual way. My passion in life is the adoration of my sons playing freely on a daily basis, on the school run and at weekends within Old Town Gardens – Swindon. It was a natural progression for me to begin a visual art project which combines my love for them and for the gardens entwined. My recent art work involves a mixture of photography of my children in the gardens, collaged with drawing and painting to explore my reverence for nature within the surroundings. The immediacy of ‘Social Media’ when launched in a positive way can be used to inform, stimulate and inspire both the viewer and the curator. Hence this led to the very recent re-birth of ‘Caroline Day – Artist’ and ‘Old Town Gardens’ Art Work – Swindon’ on Facebook”. NB: The group are looking into making postcards for the artists and possibly a calendar of art work so you can have a little piece of Old Town Garden in your own home. And that a will be a very nice thing indeed. Thank you very much for this fantastic write up and for helping to inspire others to produce art work based on Old Town Gardens and join the group.